You’d be scared, too, Mouth if you knew what was coming! 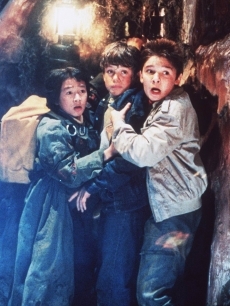 Remember that part in Goonies when Mikey whispers “It all starts here..” in the basement of the Fratelli’s hideout? That adequately sets the tone I think. I’ll start by saying that this post is a bit, uh, descriptive. You’ve been warned. I got married much later than the rest of my friends (ironically enough, Bob was one of the first of his friends to get married). So, that meant that of course we’d have children later too. I went off the pill shortly after we got married. I kept feeling as though I was behind in life. I am a very competitive person, and I felt like I was finishing last place in the race. I know it sounds silly, but after a while I started to feel more and more alienated by the things I didn’t have in common with everyone else. So, it became my mission to get pregnant. Unfortunately, nature didn’t really cooperate with us. It took almost 2 years. My best friend’s son was 5 before we got pregnant. That sort of made me sad because I wanted them all to be able to play together and 5 years seemed like a big difference. If you haven’t been through fertility treatments, this isn’t meant to be something that I want sympathy for. It was part of my journey, and if you know me, maybe picturing me going through all this will give you a laugh, even if at the time it wasn’t all that funny. Maybe you know someone going through the same thing and this can give you some perspective. If you are going through fertility treatments, you may enjoy knowing you are not alone. If you’re thinking about or going to have fertility treatments, don’t let any of it scare you. It’s a badge of honor, we wear it proudly. After about a year of trying to get preggers, I went to my doctor and got a prescription for Clomid. That’s usually the first step for anyone who’s been trying for about 12 months. You take a pill for five days, and are then instructed to, uh, perform on certain days (usually 13, 15 and 17). Ahh, the romance! I should have known I was not cut out for it when it got annoying after the second month! Well, needless to say, after 3 months of it, we had bupkus. I made a pact with myself early on that I would not become one of those women who could only talk about fertility and getting pregnant. I had known women who were slightly obsessed, and sometimes it was annoying to listen to them go on ad nauseam. Besides, I didn’t see what there was to talk about. If I was pregnant, I was pregnant. If I wasn’t, I wasn’t. Other than a couple of interesting stories (the baby making room and hyperstimulated ovaries we’ll get to), I didn’t feel there was much to tell. Now, mind you, I wasn’t private about what we were going through. I did tell most of my close friends, but we did not tell hardly any family. When there was something to tell, we’d tell. So, beware: if you tell people that you are doing fertility treatments, be prepared for the floodgates to open up. Everyone means well, and is excited for you, as you will be at first. But you will soon become frustrated as the months go on (and your treatments aren’t working) and the questions become more frequent. And sadly, half the questions don’t have answers. Many women don’t know why they have trouble getting pregnant. And if you’re like me, you may not understand half of what’s going on, you just want to have a baby, so you go with it. Yeah, I’m not sure what that blood test was for, I just know I had to have it done, and it came back normal. Normal is always good. Beyond just the general annoyances, there are a few PHYSICAL pains that are part of going through fertility treatments. They generally occur right at the beginning. For me, it was in the form of 2 painful tests. And of course, all of this is based on very precise timing determined only by Mother Nature herself. If it were up to me (and the doctors too, I’m sure), we would have gotten it all done within a few days. “Yes, please.” I never turn down a doctor’s offer to give me pain killers. Never, ever. I am a wuss when it comes to pain. So, she prescribed me some Percocet and told me to take 1-2 before the procedure. I think we went in May to have it done. Bob had to drive me because of the painkillers. So I took one at home, and then one in the waiting room. That may have been a mistake. They called me back into the changing room where I changed out of my clothes into a gown. Another woman was waiting there too, to be called back into the x-ray room. I would learn that this was common: procedures were scheduled together for efficiency. So I came across many poor souls going through exactly what I was going through. So there we sat, in two hard plastic chairs in the changing room. Not very comfortable. Had they called me back first I think I would have been ok, but the waiting was killing me. I started to get nervous, and then feel wacky from the drugs. I started to sweat profusely. My stomach was in knots. I went into the bathroom, praying the woman waiting with me would not need to use it. I was queasy and dizzy. I managed to pull myself together and splash cold water on my face. I think I made a little small talk with Woman #2. I really wanted to just curl up in a ball and cry on her shoulder and tell her how scared I was, but I kept my cool, I think. Soon, they called her back. So there I sat, alone, shaking, sweating, dizzy, trying to just close my eyes and block it all out. I don’t know what the hell was taking them so long. Then about 10 minutes later it was my turn. I walked back into the x-ray room and wondered if it was obvious how high I was. Dr. Smith was there, and I was relieved to see a familiar face. There was also a really nice tech lady there. “Oooh, I felt that!” I said. I thought the worst was over. It was over in about a minute, and the radiologist left as quickly as he came in. Dr. Smith showed me my fallopian tubes on the screen, which appeared to be clear and free of blockages. It was kind of cool to see my insides like that. And I was so glad it was all over. They told me I’d have some cramping for a few hours, and to wear a pad because some of the dye would leak out. Lovely. Fortunately, it looked like everything went well with the test and I got to spend a day on the couch with ginger ale and Spaghettios (my childhood get well meal). But, I had another fun test ahead of me (cue dramatic music). It’s called a uterine biopsy and its almost as fun as the HSG. Carrie, I had no idea you went through all of this to have a baby-who is by far the cutest I have ever seen. It makes me appreciate the many women who have a hard time getting pregnant especially since it was so easy for me. Enjoy every minute because they grow up way too fast! I love reading your blog! Your writing sounds just how you talk! Can’t wait for the next one!